Last year Janelle Monae burst onto the pop music scene with a new twist on a vintage sound, but this pixie-like firecracker has been working on a look and sound that’s all her own since she was young—find out more about her! 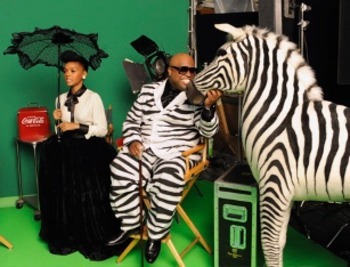 Janelle and Retro Singer Cee Lo Green in Vintage Coke Ad Photoshoot! 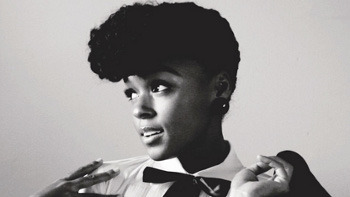 Twenty-five year old Janelle Monae Robinson is from Kansas City, Kansas, and has told reporters that she always dreamed of being a dancer and a singer. She often feels like Dorothy from The Wizard of Oz, and she says the story has influenced her music. She moved from Kansas to New York City to go to The American Musical and Dramatic Society thinking that she might eventually dance and sing on Broadway , but eventually realised music was her real passion. Janelle moved to Atlanta, Georgia, where she met rapper Big Boi from the musical duo Outkast. Big Boi quickly realised how talented the young singer was, you can see her performing on some of the songs in the Outkast movie Idlewild. In 2006 Big Boi introduced his friend Sean Combs (P.Diddy) to Janelle’s original sound and incredible vocals, and the rest is history, he signed her to his label Bad Boy right away! P. Diddy loved that she wasn’t just another pretty face, according to a Bad Boy Label Exec “loved her look, loved that you couldn’t see her body, loved the way she was dancing, and just loved the vibe. 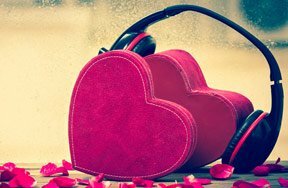 He felt like she has something that was different - something new and fresh." Janelle is critically acclaimed for her blast from the past yet futuristic style of music, but she’s also renowned for bringing class back to the music industry with a band that’s always dressed to the nines. 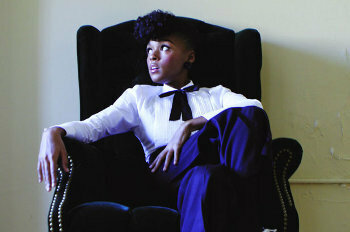 Janelle herself even wears a tuxedo for every performance—just like an old-timey lounge singer! She says about her tux: "I bathe in it, I swim in it, and I could be buried in it. A tux is such a standard uniform, it’s so classy and it’s a lifestyle I enjoy. The tux keeps me balanced. I look at myself as a canvas. I don’t want to cloud myself with too many colors or I’ll go crazy. It’s an experiment I’m doing. I think I want to be in the Guinness Book of World Records. " Here's Janelle performing "Tightrope" live on David Letterman! 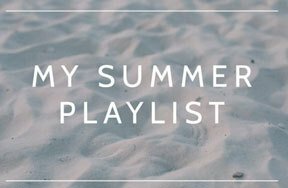 Some of Janelle’s musical influences are: Michael Jackson, Prince, OutKast, Erykah Badu, James Brown, Stevie Wonder, David Bowie, and Jimi Hendrix. Can You Dig Diggy Simmons? Get To Know Issa Thompson! "Just when I thought I said all I can say, my chick on the side said she got one on the way..." - name that track. I Don't Wanna Know - Mario Winans f/ P. Diddy. Confessions, Pt. II - Usher. All Falls Down - Kanye West f/ Syleena Johnson.